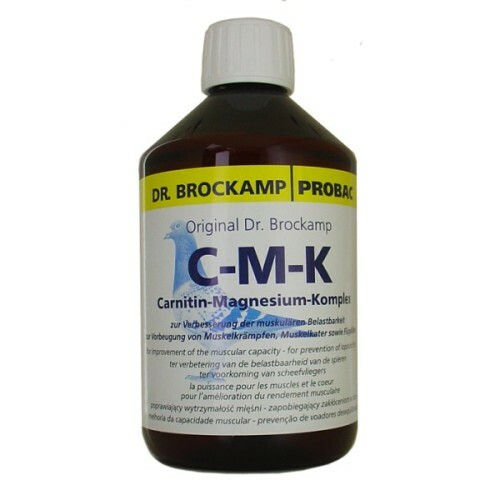 Probac C-M-K by Dr. Brockamp for powerful muscles and the prevention of muscle cramps and muscle soreness. L-carnitine is an endogenous amino acid-like substance, the long-chain fatty acids from the fat and muscle tissue transported into the muscle cell, putting the production of energy. For the smooth energy metabolism is therefore crucial that both have enough free fatty acids and carnitine are sufficient as means of transport available. L-carnitine also prevents muscle damage (sprain) and counteracts the acidity of the muscles due to lactic acid. Particularly but an additional dose of L-carnitine leads to a more powerful heart muscle. To burn fat, however, the organism also needs a lot of magnesium, which is involved as a co-enzyme in the activation of over 300 enzymes. In addition, the vital mineral is responsible for the transfer of excitation from nerve to the muscle. A sufficiently high magnesium levels in the muscle cell is a prerequisite for a functioning muscle contraction and prevents muscle cramps and muscle soreness. L-carnitine and magnesium: Power for the muscle - Power for the heart! The muscles of the pigeon that is in training has an extremely high demand both of L-carnitine and magnesium. Both substances are not covered by traditional plant-based diet (food) and must be supplied strictly as dietary supplements. Too high of magnesium, however, can also lead to mild diorrhea. Did you know that magnesium deficiency results in the first training phase in the spring can lead to the dreaded wing lock in our pigeons? Who does not know the situation of a pigeon that flies a top prize in an early season race and the next morning can not fly to his box. Usually the season for that pigeon is complete already. CMK 1000 ml containing 100,000 mg L-carnitine and in the best possible relationship with the metabolism of organically bound magnesium. As with the active iron also this special organically bound form in direct comparison to inorganic magnesium compounds from the pigeon body (gut wall) will be easily absorbed. With the administration of CMK was before the first exercise flights around the loft in the early spring will frequently prevent the phenomenon of wing lock and wing cramps so far as possible. During the competition phase it is recommended 2-4 times per week by 10-20 ml CMK per litre of water. The last 2 days before the competition CMK should be combined into the trough together with the Carbo Energizer Power.